Build your retirement with the right blocks. 1. What Is the Difference Between Annuities and 401(k) Plans? 2. What Is a Group Annuity? An annuity is a contract in which you give an insurance company a sum of money, and it invests it with a promise to repay you at some future date. It is a common technique to insure money for retirement and most traditional pensions are a form of annuity. A 401(k) is a retirement plan in which employers and employees put money aside on a regular basis to be used for the employee's retirement. There are three basic types of annuities: fixed, variable and indexed. Variable annuities are regulated by the Securities and Exchange Commission as securities. Fixed annuities are not regulated by the SEC, and indexed annuities may or may not be, depending on how they are set up, but most are not. A fixed annuity guarantees an interest or earnings rate for the life of the contract and also may include provision for regular payments for a specified period of time. A variable annuity lets you choose your investment options so the return varies with those results. Payments also will vary. An indexed annuity is based on performance of something like the Standard and Poor's 500-stock index but usually includes a guaranteed minimum. A 401(k) is a "defined contribution" retirement account that allows employees to defer a portion of their pay for contributions to the plan, which are matched to some degree by the employer. Employers provide investment options, typically mutual funds, which an employer can choose. A basic or traditional 401(k) allows an employee to deduct contributions from taxable income. 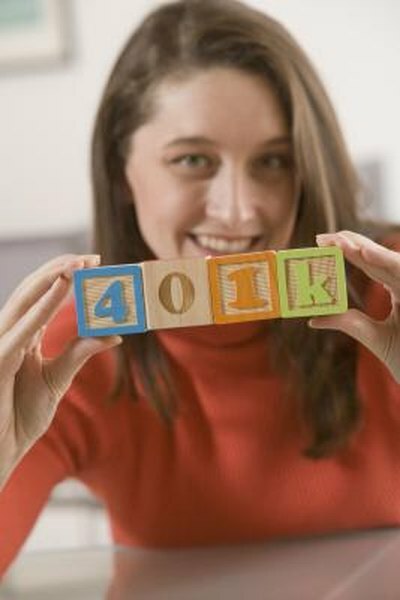 Some employers allow 401(k) investments in annuities as a way to give employees a fixed and guaranteed regular income upon retirement. With a traditional 401(k), an employee has the option to withdraw the entire amount at age 59 1/2 or take any amount after that age. An employee is required to take minimum distributions starting at age 70 1/2. A Roth 401(k) doesn't provide any deductions on contributions but does not have a required withdrawal. Annuities may be immediate, with payouts beginning as soon as the annuity is taken out, or deferred, not starting until some future time, such as a retirement date. Annuities can guarantee payments for a certain number of years, with payments to continue to survivors if the account holder dies, or be lifetime, which terminate at death. Some annuities include death benefits, with a specified amount to be paid on the death of the holder. Happy Living magazine: What Is the Difference Between Annuities & 401k Plans?